May 14, 2014 in the exhibition “Aqua-Therm Kiev 2014” International Scientific and Practical Conference “Energy efficiency and resource in the housing and communal services – main direction of development of the industry”, organized with the active support of the Interdisciplinary Association for the Advancement of heating systems” Ukrteplokomunenerho”. 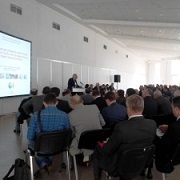 The conference was attended by representatives of the Ministry of Regional Development, National Commission, carrying out state regulation of utilities, heads of district heating organizations, manufacturers and suppliers of equipment, representatives of higher educational institutions, etc. July 19, 2012 there was a meeting of energy auditors, which adopted a new format of the Association of Energy Auditors. Organized and taken part in nine events, which popularized the idea of ​​the need for energy audits.